When I read the front flap, I immediately know that I must borrow this book, another book for parents. I do not want to be a tiger mum but I cannot be a laissez-faire mum either. In competitive Singapore, either style does not fit me. I have bought books and flashcards in sets, even the toys must serve a purpose for the child to learn. Even when the playgroup teacher told me that my child is advanced for her age, I was sceptical. Did she just say it to make me feel happy? Though I cannot define my parenting style, I know it is somewhere between tiger mum and laissez-faire mum. After reading this book, I know I am on the right track. I parent on as what my intuition tells me. If I am too tired for a bedtime story, I just tell her a two-sentence story. All flashcards can wait if she is more interested in toys. Intuitive parenting emphasizes focusing on your child, enjoying the moment, and reacting naturally to whatever the baby is doing. The book is very thick, including a chapter on brain science. If you are too busy to read the whole book, each chapter ends with a summary of the chapter. Have you ever wondered how to be the best parent? What is the best for your child? Read this book and you might just realize that you are the best person for your child. Happy reading! 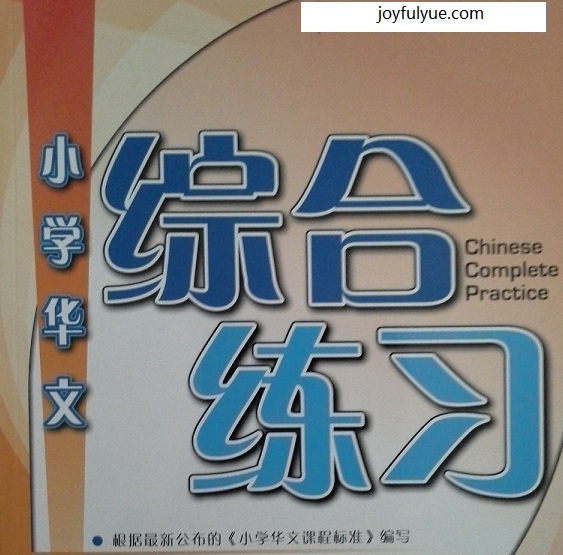 In 2014, I borrowed a book, 《学习方法》, which is suitable for students and learners. In 2017, I borrow a book,《孩子，我留什么给你 —— 一定要留给孩子的7大能力》, which is suitable for parents. 《孩子，我留什么给你 —— 一定要留给孩子的7大能力》 has a long title. The title in English is “Children, what do I pass down for you? — The 7 abilities that must be passed down to children”. The writer is a mother to two daughters. As a parent, she has wondered what to pass down to her children. I have wondered the same too. Is it money? Is it important moral value, such as honesty? If you are wondering the same issue, this is a good book. From the title of the book, the author writes about the seven important abilities (to be exact, six abilities and time) that she wants to pass down to her daughters. While there might be controversy whether a child needs us since birth or later when they are children, I strongly support “since birth”, rather than “later when they are children”. The first thing that newborns need is sense of security. Once they have the sense of security, they are good with whomever, whether a domestic helper or a grandparent. Time is precious, growing up is only once and you can’t turn back time. For each chapter, one or two children books are recommended for you and your children to read together. It is also a parenting book. For example, in Chapter 13: 小孩吵架，大人不要插手 (When children quarrel, adults do not intervene). The author writes about her father-in-law passing away in Chapter 2. Her two daughters have given her the power to give her husband the necessary support. Have you ever wondered what to pass down to your children? If yes, this book will answer your question. Happy reading! The Little Prince is a famous book, but it has never been in my bucket list because of my education background. 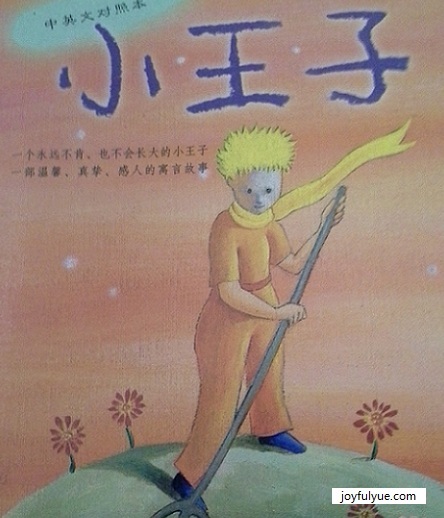 During school, we have a long list of Chinese story books and novels to read that I have never thought of reading The Little Prince. One day, my friend lends me the book. Maybe it is time for me to read the book? This is a bilingual book. I read the Chinese language section while referring to the English language section once in a while. After reading the book, the impression I have on The Little Prince is only one word: sad. The Little Prince, whom we do not know his age, has his own views on the universe. He seems pessimistic at times, but he is optimistic at other times. I believe people at different ages read with different perspectives and gets different conclusions. As a mum-to-be, I think about my child’s future while thinking about the philosophy that I would teach my child in future. Literally, the flower is happy that she has roots that help her not to be blown away by the wind. On the other hand, we can think of roots as our traditions and cultures that define us. I start thinking about what types of “roots” to give to my child. Have you read The Little Prince? If no, please have a thought at reading it, at least once. If yes, please consider to read it the second time or the third time or the n time. The simple story is sure to give you some surprises even you have read it before. For children, I would recommend this book to be read as a story book to learn new vocabulary and learn two languages at the same time. For the philosophy part, we leave it to the adults. I borrowed this book from the library and found out that it is a book worth reading by students. 《学习方法》 is translated from a Korean book. Thus, the examples in the book are from Korea. From the title of the book, the book writes about learning methods that can help students to excel in learning. I see a lot of “Study OK!” in the book and on the book cover but I am not sure if it is the English title. There are five sections with one extra bonus on study techniques for different subjects. The first section is about what you need to learn, namely a goal or target, confidence, focus, persistence, etc. We always plan to learn, but we need to plan to play too. Else, we will play and forget the time and eventually affect learning. When we plan, we plan two hours for Chinese language. The question is, how much you want to learn in two hours? A chapter? Ten new words? We need to include how much we want to accomplish and how much to learn in the plan so that we have a target to keep us going. The third section is about how to find a suitable learning style for yourself. The style that is suitable for your friend may not be suitable for you. The fourth section is about how to tackle examinations and the final section is about different ways to learn. Other than the bonus section, there are a lot of cute drawings in the book too. Do you face problems in learning? If yes, you may find this book useful. Happy reading and learning! New school year is starting soon. 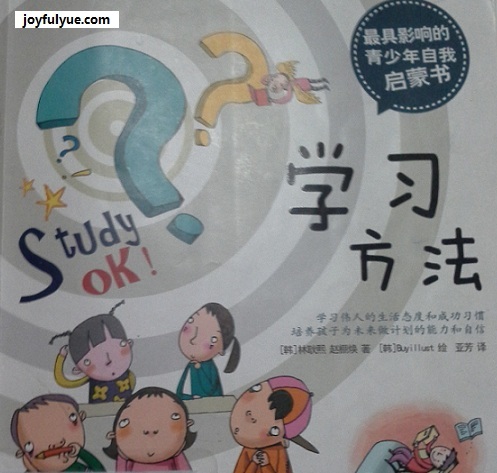 Are you thinking of buying a Chinese language assessment book for your children? The exercises are arranged by chapters you learn at school. It does not separate into two books for each semester (For example, book 3A for semester 3A and book 3B for semester 3B) and thus you only need to buy one book each year. 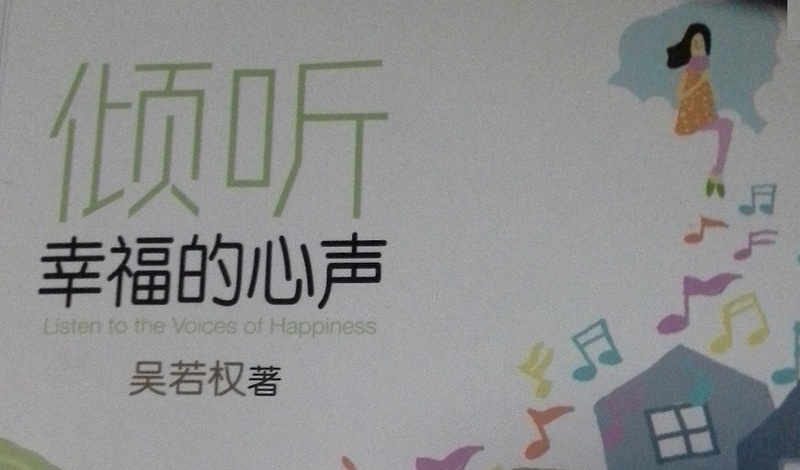 It includes a composition exercise (看图作文) at each chapter. There are two exercises on oral and listening (one at mid-year revision and another one at year-end revision). It is available for each primary school year. Whether your children are attending tuition or not, this book can be used as a revision after they have learnt each chapter at school. If I want to nitpick, I would like to see 命题作文 to be included for higher primary books. It is because PSLE Chinese Language has both 看图作文 and 命题作文. Exposure to both types of composition exercises will help to boost the confidence of the students taking PSLE. A note for international students who would like to learn Chinese language using the book, please consider buying the textbook of the same academic year as well. Publisher: Educational Publishing House Pte. Ltd.
Disclaimer: This is just a suggestion for parents and students. You can get the book from major bookshops. I do not earn anything from anyone, anywhere, anytime by writing this post. This post is just for sharing. Depending on the gender, you can choose princesses for girls and robots for boys. If you want something unisex, choose pets or nature theme. 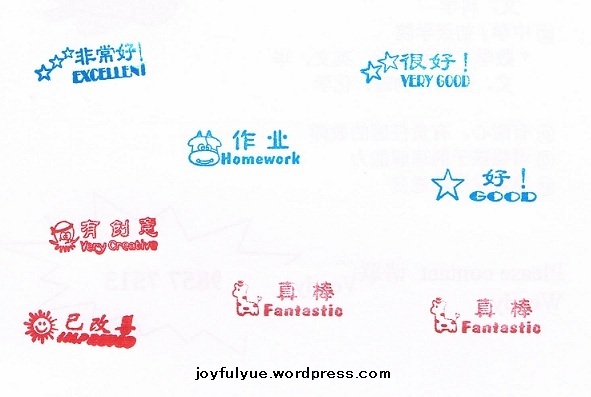 The stickers can be given for a job well done and are suitable for both primary and secondary students. I have a “Homework” stamp which works wonder whenever I want my students to do homework. The stamp serves as a magical spell; if the child sees the stamp on his / her assessment book, he / she has the responsibility to finish it before the next class. I also have other stamps with encouraging words on them, such as Well Done, Excellent, Very Good, etc. The children try their very best to do the homework and the encouraging stamps are there on the page permanently to serve as an encouragement for the children to do better next time. Some secondary students may think stamps are childish, thus stamps work wonder for primary students only. Nowadays, children are showered by gifts; they get stationery from school teachers and parents. Thus, if you want to grab their attention, give them something special and sophisticated. They will remember it for a longer period. Of course, you may be having a difficult time finding a “special something”, so do not give on a regular basis. Once in a blue moon, when you have found some special stationery, keep it for special occasion, such as Children’s Day. Parents may be surprised, children like to talk and share their experience. Maybe you are too busy to listen to them and always ask them to keep their mouth shut. Lucky for me, I teach Chinese language. As a result, whenever the child wants to share something, I will grab the chance to teach him / her some related Chinese words. I also encourage my students to speak in Chinese language to me. Just like stationery, you must be selective about the story books to share with children. Generally, younger children like story books with images. The story must also suit the age language proficiency of the child. If the words used in the story book are too difficult for the child, he / she will not have the interest to read the story book. Other than the 5S, you may also want to look for children newspapers or magazines to enhance learning. Nonetheless, do not make it like homework. Singapore schools give children magazines and/or newspaper to the students. Teachers may have noticed that not all students read the extra reading materials, and thus they ask the students to do the exercises in the reading materials. Case study: I select some interesting topics from a bi-weekly children newspaper to share with my 7-year-old student. There was once when the new issue had not reached me, but the student wanted to read more. So, I asked him to read the children magazines, which he has more than 15 issues, from school. He refused. He said those are “homework”, not magazines. I am glad that the student wants to read my newspaper. On the other hand, I am sad that he treats the magazines from school as “homework” and refuse to read them at home. My greatest satisfaction is that I have successfully instilled the reading interests in my students. It is the little thing that makes a big difference. Let’s find out what interest your child and help them to excel in learning!